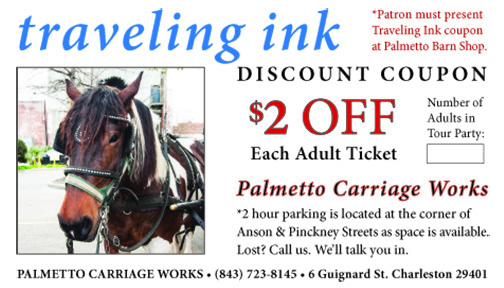 This coupon is good for a discount for all adult guests taking a one hour carriage tour of the Charleston, SC historic district. Print out the coupon, fill in the number of adults taking the tour, and bring it to Palmetto Carriage Works to redeem the discount. Carriage tours of the residential area run from 9:00 a.m. until 5:00 p.m. during daylight savings time and until 4:00 p.m. during winter months. If visitors would like help finding the Big Red Barn or the Palmetto parking area, they are welcome to call (843) 723-8145. A staff member will be happy to talk them in. **There is an extra charge for guest parking. Click here to go back to information on Palmetto Carriage tours. Click here for access to other Charleston coupons and promo code discounts.